As a parent you are your child's first teacher. There are a variety of things you can teach your child as you move throughout the day, read books or sign, and explore. One of those things is the alphabet! Kids are naturally interested in alphabet letters and many notice similarities and differences. Some kids also begin to identify letters that have meaning to them, like the letters in their names. 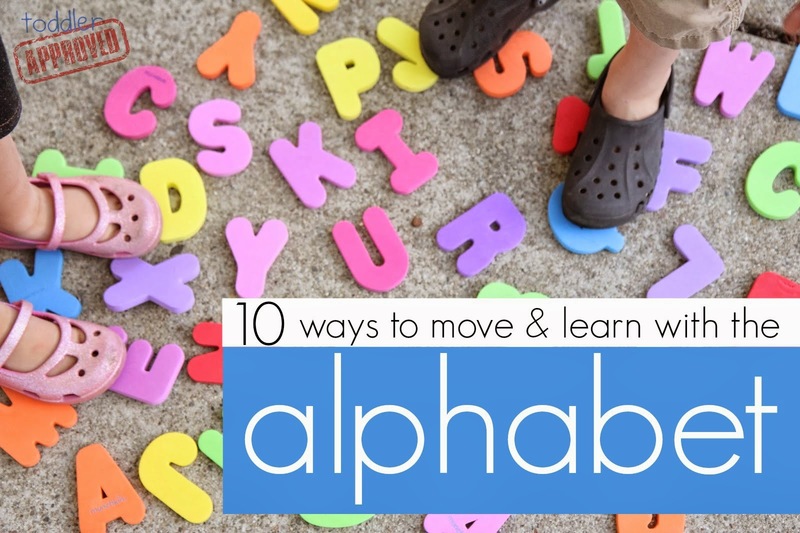 As my kids show interest in the alphabet I love to find ways to move and learn with an alphabet theme in addition to just noticing the alphabet in our environment. Today I am going to share the giant alphabet sticker board we created to play connect the dots! This activity is part of our third annual Back to School Basics series that we kicked off on Monday. Today's activity will focus on identifying and matching alphabet letters. Yesterday we had fun with shape matching, on Tuesday we explored numbers 1-10 with a number toy hunt and on Monday we did a name art activity and game. To get started we stuck our large easel paper on a big empty wall in our hallway. We used painter's tape so that the tape wouldn't pull the paint off our wall. 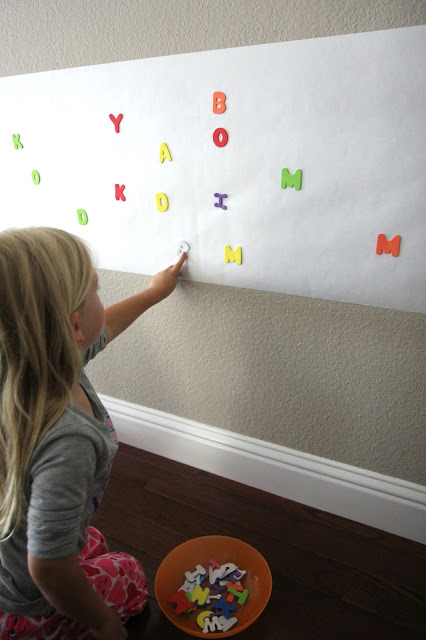 Next I gave the kids several alphabet stickers and encouraged them to start sticking them all over the wall. I asked them to spread them out so that they weren't in huge clumps. We tried to use a variety of alphabet letters and duplicate several of them. We probably could've just ended the activity right there. My kids love stickers... so they could've added stickers to our large sticker wall for hours! 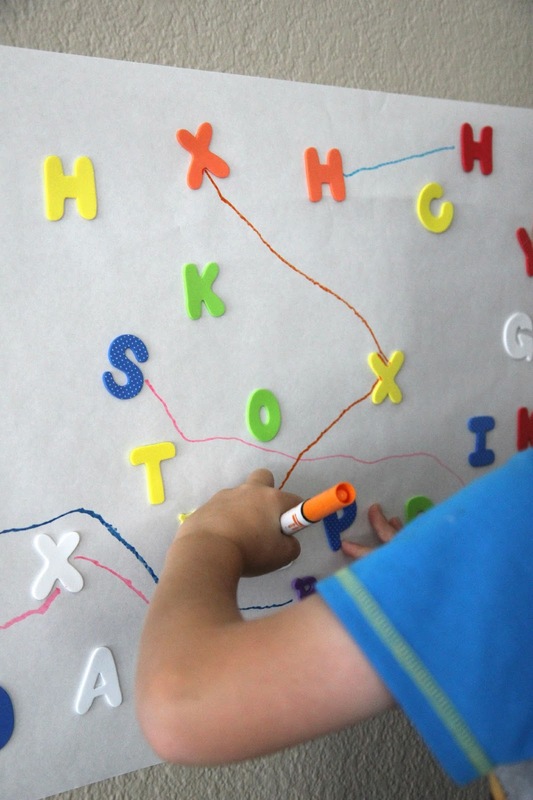 This is a great fine motor activity since the kids have to pull the backing off the stickers. My 2 year old really loved this part and perservered even when it was hard sometimes! 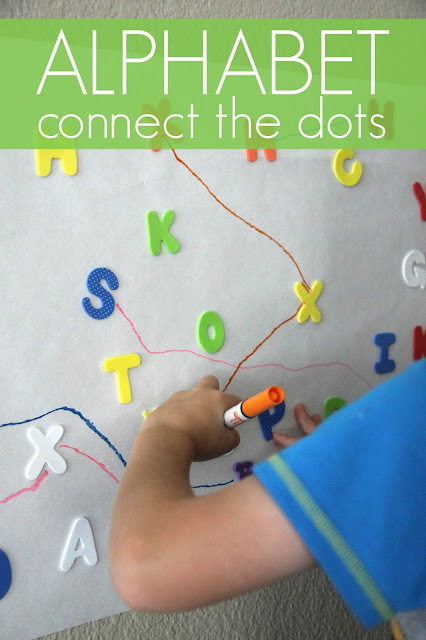 To play our connect the dots game each child was given a different color marker (or crayon) and the kids took turns drawing lines from one alphabet letter to a matching alphabet letter somewhere else on the paper. My older kids (ages 7 and 4) played the connect the dots game while the 2-year-old played with stickers. 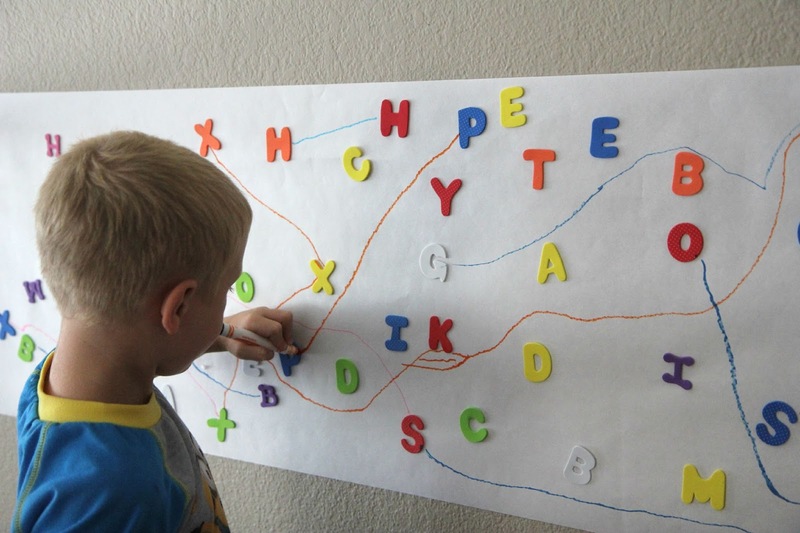 You can make another sticker wall just for your toddler and have him connect the colors instead of connecting the alphabet letters. We kept "score" loosely of how many matches kids were able to make correctly. I encouraged them to try and connect all of the letter As on the entire board... and then all the C's and so forth. The best part about this game is that it is open-ended and doesn't have to be played all at one time. You can start it... then take a break... then play again. While we played we talked about words or names that started with each alphabet letter. We even mentioned the sounds the alphabet letters made and tried to practice them. ** Instead of using markers you could cover the top of the paper with contact paper (sticky side out) and then connect the dots using ribbon or pipe cleaners! 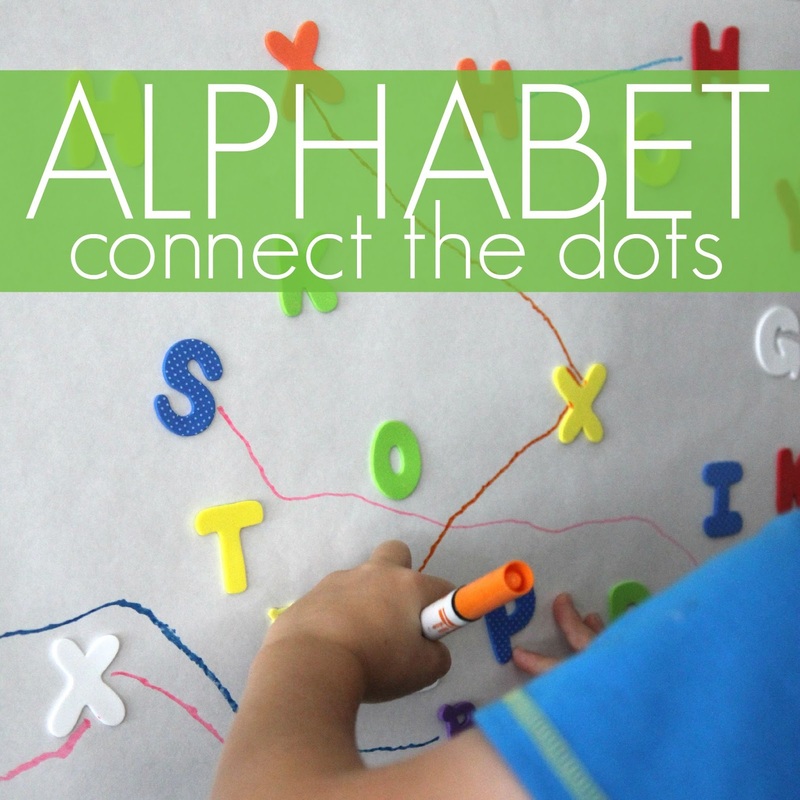 Need some other alphabet activities to try? Check out these 10 Ways to Move & Learn with the Alphabet. You can also head on over to my Alphabet Activities Pinterest board for additional ideas.